DECLARATION OF THE ORIGINAL PEOPLES OF EL SALVADOR, NAHUAT, LENKAS AND KAKAWIRAS, INDIGENOUS PEOPLES OF THE SACRED LAND OF THE SMILING JAGUAR, DURING THE 18TH SESSION OF THE PERMANENT FORUM ON INDIGENOUS ISSUES. FROM 22 APRIL TO 3 MAY 2019. - We recommend that the State of El Salvador correct the texts used for teaching the Nahuat language so that they do not fall into folklorism, but rather that they become a foundation to elevate the true original culture of the country. We also recommend that they prevent indigenist individuals from appropriating knowledge and that priority be given to original communities so that they themselves can develop their own methods for the revitalization of languages. - We view with concern the damage suffered by the biosphere of Cerro del Aguila, in the municipality of Juayúa, and in the UNESCO-protected areas of Aneca-Ilamatepeq, where even dams are built on the Sensunapan River, which is part of a greedy process against our heritage, as is also the case of Tacuzcalco of Nahuilingo, where the sacred site is being destroyed—all of this is in Sonsonate. And this could be avoided if the State of El Salvador ratified and implemented ILO Convention 169 and/or took the decision to comply with ILO Convention 107. - We demand that the Legislative Assembly of El Salvador adopt a COMPREHENSIVE WATER LAW that AVOIDS THE PRIVATIZATION OF VITAL LIQUID and that includes the HUMAN RIGHT TO WATER, as well as the regulation for the well-being of TRANSBOUNDARY WATERS, to protect our territory from collateral damage resulting from the contamination of aquifers and their basins. We also believe that the Salvadoran State must safeguard the autonomy of our peoples, starting with food sovereignty by means of a FOOD SOVEREIGNTY LAW that guarantees the protection of our original seeds in such a way that generates necessary spaces for the conservation of our ancestral practices and our nourishment. - It is essential to pay attention to development projects that only increase El Salvador’s external debt and expose future generations to a lack of territorial autonomy that could affect our natural spaces at risk of being granted as concessions and/or privatized, and which we, as Indigenous Peoples, seek to preserve. - Criminal groups, especially gangs, are creating insecurity by causing forced displacement from our territories, as these groups have usurped entire areas and lands belonging to indigenous brotherhoods or original peoples’ organizations, and they have extorted indigenous traders and artisans, endangering their lives. Therefore, we demand that the Salvadoran State implement effective strategies to restore peace and tranquility to our communities. - We request that the Government of El Salvador create a TRUTH COMMISSION to bring clarity to the genocide-ethnocide of 1932, so that, on the basis of this truth, processes of compensation for the damages suffered by the Indigenous Peoples may be implemented. At the same time, we denounce any version of AMNESTY that would exonerate from guilt the perpetrators of past and present murders and massacres. - We denounce the fact that the Salvadoran State has not generated actions to implement the Public Policy for Indigenous Peoples, a policy that was built by and for Indigenous Peoples, and which is being displaced by a National Action Plan that has not undergone consultation, a clear violation of Article 19 of the UN Declaration on the Rights of Indigenous Peoples. - Finally, we ask the incoming government not to centralize an indigenist NGO to such an extent that there is no legitimate representation in vital areas such as the Indigenous Fund; rather, we request that the next government take into account the voice of all original peoples, organizations and communities in the country. May the Great Creator of the Universe give you wisdom and light to always guide your paths. Pajpadiush, Umetiu. INDIGENOUS PEOPLES IN EL SALVADOR. I am Freda Huson of Unist’ot’en – Wet’suwet’en People of Canada. I am here today to express concerns with Human Rights Violations happening to my people. Since time immemorial, my people have lived in a balanced relationship with our lands. We depend on the land to survive, and we are responsible for protecting it. Since Canada began settling on our territories, we have been forced onto reservations and away from our traditional land base. There are fewer and fewer animals to hunt, the salmon run is diminishing, and the water in the river is low. In order to protect what we have left, my family has been reoccupying one of our territories at Talbeetskwa which is along the Morice River in northern British Columbia. My ancestors have lived there since time immemorial, and I have been living there permanently for the last ten years. In these ten years we have constructed a cabin, a healing centre for members of our community who are healing from colonial trauma and addiction, a traditional Pithouse and permaculture garden. We re-occupied our lands to prevent industry from invading and polluting them for pipeline projects. We have practiced free prior and informed consent to determine who is given access to the territory. We make decisions about our lands through our system of hereditary leadership and participation in our feast hall. Our hereditary chiefs have said “no” to pipelines on Wet’suwet’en territory. 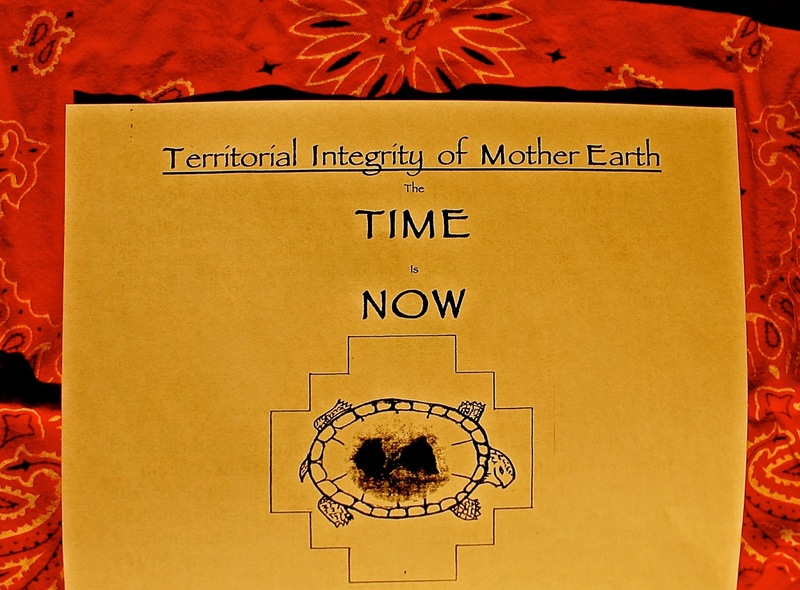 This year, a pipeline company forced a court injunction on us. If we stop them from entering our territory because they don’t have consent, we face arrest. We have not been able to hunt or gather our traditional foods. The company has security and police force to keep us from exercising our Indigenous rights. Elders, women, and healing center clients have been threatened with arrest for accessing our own territory. The pipeline company is violating Wet’suwet’en law, trespassing on our territory, and starting to destroy the land. They have already destroyed a heritage site. After they bulldozed part of the forest, we searched through the piles of dirt for evidence of my people. We found artifacts. The archaeology branch of the government with police assistance came in and took the artifacts, and then released a news bulletin claiming the artifacts were not from their original place. They are trying to erase us from our own land. All these acts that continue are acts of genocide. They want to extinguish our rights to our lands. My people depend on our territory for berries, medicines, meat and healing on the land. I am here today to make UN aware of the continued genocide happening in Canada, and to demand that our Indigenous rights and laws are respected. DECLARACIÓN DE LOS PUEBLOS ORIGINARIOS DE EL SALVADOR, NAHUAT, LENKAS Y KAKAWIRAS, PUEBLOS INDÍGENAS DE LA SAGRADA TIERRA DEL JAGUAR SONRIENTE DURANTE EL 18vo. PERÍODO DE SESIONES DEL FORO PERMANENTE PARA LAS CUESTIONES INDÍGENAS. DEL 22 DE ABRIL AL 3 DE MAYO 2019. - Que el Estado de El Salvador corrija los textos de enseñanza del idioma Nahuat para que estos no caigan en el folklorismo, sino que sean base para enaltecer la verdadera cultura originaria del país. Que evite que personas indigenistas se apropien de los conocimientos y se dé prioridad a las comunidades originarias para que estos puedan desarrollar por si mismos sus propios métodos para la revitalización de los idiomas. - Vemos con preocupación el daño que sufre la biosfera del cerro del Aguila del municipio de Juayúa y de las zonas protegidas por la UNESCO de Apaneca-Ilamatepeq, donde incluso se construyen represas sobre el río Sensunapan, lo cual es parte de un proceso voraz sobre nuestro patrimonio, tal como también ocurre con el caso Tacuzcalco de Nahuilingo, donde se está destruyendo el sitio Sagrado, todo esto en Sonsonate. Y esto podría evitarse si el Estado de El Salvador ratificara e implementara el Convenio 169 de la OIT y/o tomará la decisión de cumplir el Convenio 107 de la OIT. - Exigimos a la Asamblea Legislativa de El Salvador que apruebe una LEY INTEGRAL DE AGUAS que EVITE LA PRIVATIZACIÓN DEL VITAL LÍQUIDO e incluya el DERECHO HUMANO AL AGUA así como la regulación por el bienestar de las AGUAS TRANSFRONTERIZAS, para proteger nuestro territorio de daños colaterales producto de la contaminación de los mantos acuíferos y sus cuencas. También consideramos que el estado salvadoreño debe velar por la autonomía de nuestros pueblos, empezando por la alimentación soberana por medio de una LEY DE SOBERANIA ALIMENTARIA que garantice la protección de nuestras semillas originarias de tal modo que genere los espacios necesarios para la conservación de nuestras prácticas ancestrales y nuestra alimentacion. - Es indispensable que se ponga atención en proyectos de desarrollo que solo aumentan la deuda externa de El Salvador y que exponen a las futuras generaciones a una falta de autonomía territorial que podría llegar a afectar nuestros espacios naturales ante el riesgo de ser concesionados y/o privatizados y los cuales buscamos conservar como Pueblos Indígenas. - La inseguridad producto de los grupos delincuenciales, sobre todo de las pandillas, están provocando el desplazamiento forzado desde nuestros territorios, ya que estos grupos han usurpado zonas y terrenos completos que pertenecen a cofradías indígenas u organizaciones originarias, así como extorsionan a los comerciantes y artesanos indígenas lo cual pone en peligro de muerte sus vidas. Por lo que exigimos al Estado Salvadoreño implemente estrategias eficaces que devuelvan la paz y tranquilidad a nuestras comunidades. - Solicitamos que el Gobierno de El Salvador cree una COMISIÓN DE LA VERDAD que esclarezca el genocidio-etnocidio de 1932 para que a partir de la verdad se implementen procesos de resarcimiento sobre los daños sufridos a los Pueblos Indígenas y denunciamos a la vez toda AMNISTIA que exonera de culpa a los hechores de asesinatos y masacres pasadas y presentes. - Denunciamos que el Estado salvadoreno no ha generado acciones para aplicar la Política Publica para los Pueblos Indígenas, política que fue construida por y para los Pueblos Indígenas, la cual esta siendo desplazada por un Plan de Acción Nacional que no ha sido consultado y eso es una clara violación al articulo 19 de la Declaracion de las Naciones Unidas sobre los derechos de los pueblos indígenas. - Finalmente pedimos al gobierno entrante que no centralice a una ONG indigenista, a tal grado que no hay representatividad legítima en espacios vitales como el Fondo Indígena, por lo que solicitamos al próximo gobierno que tome en cuenta la voz de todas las organizaciones, pueblos y comunidades originarias del país. Que El Gran Creador del Universo les dé sabiduría y luz para guiar siempre sus caminos. Pajpadiush, Umetiu. 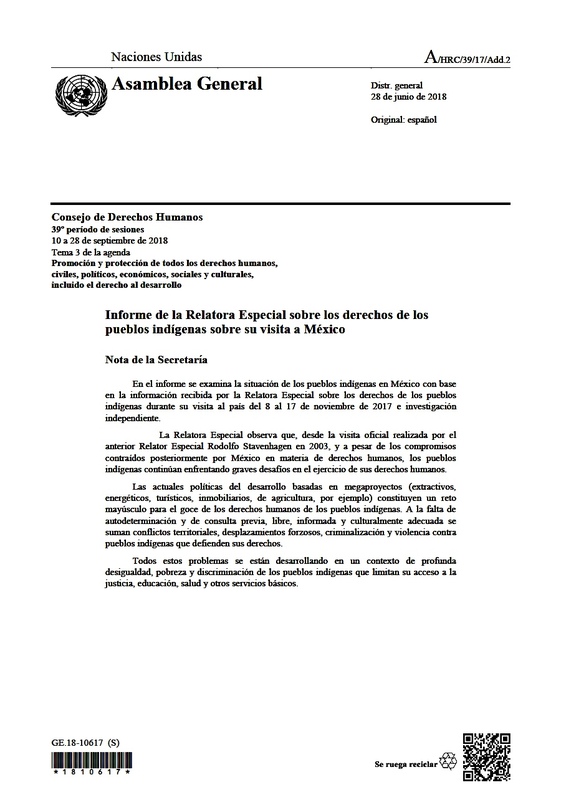 In consequence and implementation of the pertinent recommendations formulated by the UN Permanent Forum on Indigenous Issues in previous sessions, we call for the integration of a formal evaluation and a methodology of the processes of repudiation and dismantling of the racist relic of the by the government states of the Americas by the Special Doctrine of Discovery Rapporteur on each and every one of her official visits to countries whose claims of jurisdiction as successor states to the Doctrine on our continent of Abya Yala [Americas] are normalized by the Doctrine of Discovery of Christendom, the Papal Bulls of Pope Alexander VI Inter Caetera (1493) and the concept of “Original Property of the State” in the Americas. This is also a context for the urgent call to the international community and all human rights defenders to denounce the legaloid systems of oppression normalized by the so-called national "immigration" legislation policies and practices of the successor states to the Doctrine of Discovery in the Americas, and their respective international borders. We denounce once again and demand international responsibility and proper prosecution, and not simply "redress" or "reconciliation," even as we did in 1987 before the United Nations Commission on Human Rights, for the systemic collusion between the states of North America [NAFTA 1994-USMCA 2018] in violation of the right of self-determination of our Original Nations of Indigenous Peoples, equal to all other peoples. In this regard, we give special attention to the proposed construction of a "wall" along the line of the border established by the United States and Mexico by the Treaty of Guadalupe Hidalgo (1848), in violation of right of Free, Prior and Informed Consent as Original Nations of the Indigenous Peoples of Anahuac. In the same regard, in defense of the right of Free, Prior, and Informed Consent as Indigenous Peoples we denounce the violation of our Collective Rights as Original Nations of Indigenous Peoples of Mother Earth in the processes of consultation and subsequent proclamation in December 2018 in Morocco of the UN GLOBAL COMPACT FOR SAFE, ORDERLY AND REGULAR MIGRATION. “The Government of Canada recognizes that meaningful engagement with Indigenous peoples AIMS TO SECURE their free, prior, and informed consent when Canada proposes to take actions which impact them and their rights, including their lands, territories and resources." These are the same guys who took aim at William 'Wolverine' Jones Ignace during the Ts'Peten/ Gustafsen Lake Standoff in 1995. 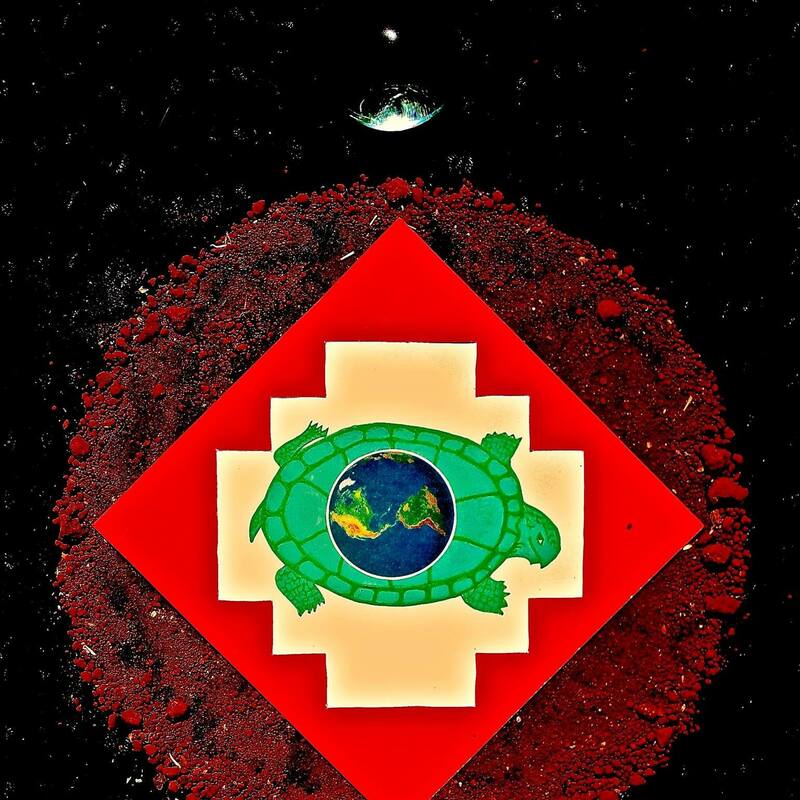 They fired 77,000 rounds of ammunition into the camp, yet Wolverine walked out of the Ts'Peten/ Gustafsen Lake Standoff on September 17, 1995 in full command of all of his physical and spiritual powers as an unbroken warrior of the Ts’Peten and all Original Nations of Indigenous Peoples of the Great Turtle Island Abya Yala. En consecuencia y en cumplimiento de las recomendaciones pertinentes formuladas por el Foro Permanente de Cuestiones Indígenas en sesiones anteriores, pedimos la integración de una evaluación formal y una metodología de los procesos de repudio y desmantelamiento de la reliquia racista de la Doctrina del Descubrimiento por los estados gubernamentales de nuestro continente Abya Yala [las Américas] por la Relatora Especial en todas y cada una de sus visitas oficiales a los países cuyos reclamos de jurisdicción como estados sucesores de la Doctrina todavía están normalizados por la Doctrina del descubrimiento de la cristiandad, las Bulas Papales del Papa Alejandro VI Inter Caetera (1493) y el concepto de "Propiedad Originaria de la Nación" por los estados americanos. Este es un contexto también para el llamado urgente a la comunidad internacional ya todos los defensores de los Derechos Humanos para denunciar los sistemas legaloides de opresión normalizados por la llamada legislaciones nacionales de "inmigración", políticas y prácticas de los estados sucesores a la Doctrina del Descubrimiento en las Américas, y sus respectivas fronteras internacionales. Denunciamos una vez más y pedimos la responsabilidad internacional y el procesamiento adecuado, y no simplemente la "reparación" o la "reconciliación", incluso como lo hemos hecho en 1987 ante la Comisión de Derechos Humanos de las Naciones Unidas, por la colusión sistémica entre los estados de América del Norte [NAFTA-USMCA] en violación del derecho de libre determinación de nuestras Naciones Originarias de Pueblos Indígenas, igual a todos los demás pueblos. En este sentido, prestamos especial atención a la construcción propuesta de un "muro" en la línea de la frontera establecida por los Estados Unidos y México por el Tratado de Guadalupe Hidalgo (1848), en violación del derecho del Consentimiento Libre, Previo e Informado como Naciones Originales de los Pueblos Indígenas de Anáhuac. En el mismo sentido, en defensa del derecho de Consentimiento Libre, Previo e Informado de Pueblos Indígenas, denunciamos la violación de nuestros derechos colectivos como Naciones Originales de los Pueblos Indígenas de la Madre Tierra en los procesos de consulta y la proclamación en diciembre 2018 por las Naciones Unidas en Marruecos del Pacto Mundial para establecer una Migración Segura, Ordenada y Regular. Si se trata del reclamo de sucesión por el gobierno de Canadá a la jurisdicción territorial a través de la Doctrina del Descubrimiento (1492) y de las Bulas Papales Inter Caetera (1493) según los términos de la Proclamación Real de 1763, o la reclamación por jurisdicción territorial de los EE.UU. bajo el decreto Johnson v. M'Intosh de la Corte Suprema de 1823, o la reclamación de lo mismo por la República de México en virtud concepto de “Propiedad Originaria de la Nación” de la Constitución de 1917: las tres superestructuras federales de derecho común y civil, comparten el linaje y el precedente de la colusión ilegal y la complicidad con la normalización del los principios racistas de la Doctrina del Descubrimiento de la Cristiandad (12 de octubre, 1492). A pesar de la Resolución 1514 (1960) de la Asamblea General de las Naciones Unidas, que proclamó la colonización como una violación ilegal del Derecho Internacional, esta infraestructura geopolítica colonial de los estados de América bajo la cual se implementó el TLCAN original continúa como norma, política y ley, incluso ahora bajo los mecanismos de “modernización” según USMCA 2018 (T-MEC). Es un sistema legaloide. 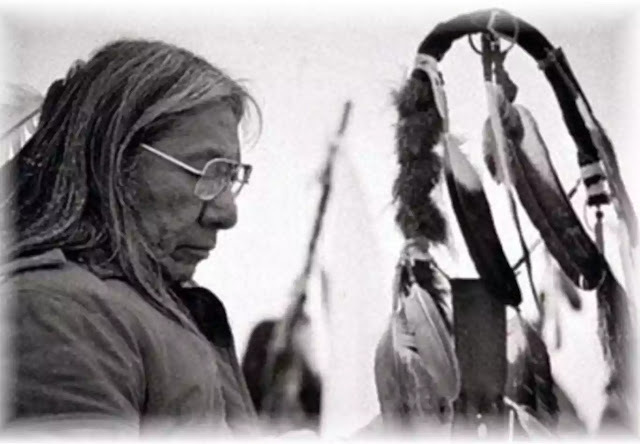 Entre ellos, que son innumerables, los que llevan el reconocimiento de los grandes defensores y ejemplos de los valores de la Nación Lakota aparecen los nombres de Sitting Bull (Toro Sentado) y Crazy Horse (Caballo Loco). Son personajes históricos de alto prestigio, hasta ya legendario, por sus acciones y sacrificios en defensa de los territorios de la confederación tradicional de alianza de las Naciones Dakota-Nakota-Lakota. Ambos, Sitting Bull y Crazy Horse fueron asesinados por agentes de la policía militar del gobierno de los Estados Unidos, al haberles capturado después de luchas de gran resistencia en forma armada contra la invasión de los Europeo Americanos de territorios ancestrales de las Naciones Originales. Hoy se reconoce como los estados de Dakota del Norte y Dakota del Sur. Es una geografía de los llanos grandes del norte del continente Abya Yala [Norte América] que fue en donde, hace 150 años, las Naciones Originarias de la Confederación Oceti Sakowin (Siete Consejos Dakota-Nakota-Lakota) lucharon con fuerzas armadas contra la invasión de los europeo americanos. Lucharon y ganaron. Lograron enfrentar la invasión militar de los estados unidos con su caballería (Custer 7 Batallón) y forzó el gobierno gringo reconocer y respetar los limites de su territorio ancestral por vía de un Tratado Internacional conocido como el Tratado de Fort Laramie 1868. Cuando los jefes de la Nación Independiente Lakota emergieron del conflicto (también armado) de Wounded Knee 1973 en Dakota Sur, con camino hacia las Naciones Unidas, fue con el propósito y fin de que el Tratado de Fort Laramie 1868 fuera la base de las negociaciones entre la Nación Lakota y el gobierno de los Estados Unidos. Como pacto internacional, el Tratado de Fort Laramie 1868, el un instrumento entre naciones, no un dictamen domestico o reglamento constitucional de los estados, que pretende reducir el derecho internacional indígena a procedimientos jurídicos contextualizado por los sistemas legaloides de los colonizadores y sus formaciones sociales, políticos, y legales. Igual, cuando el gran Levantamiento de Standing Rock 2016 contra la invasión de la corporación petrolera Dakota Access Pipeline (DAPL) retomo la lucha de defensa de los Treaty Territories, la demanda ante la corporación, el gobierno de los Estados Unidos y la comunidad internacional fue el mismo: Reconocimiento y protección jurídico internacional para los territorios reconocidos en el Tratado Fort Laramie 1868. Ya cuando los invasores europeo-americanos no pudieron derrotar con agresiones militares la defensa de las Naciones Originarias Dakota, implementaron la estrategia de acabar con la base de nutrición de sus naciones, tanto material como espiritual, el búfalo de los llanos grandes. Después de una deliberada matanza y guerra de extinción, el búfalo se desaparece y los Pueblos Originarios caen en un marasmo de hambruna, debilidad y opresión que el gobierno aproveche para capturarlos y encerarles en reservaciones manejados desde Washington, DC. Huyendo de estos asesinatos y masacres genocidas, en 29 de diciembre 1890, otro jefe Lakota mas nombrado Spotted Elk cayo como víctima igual, junto con casi 300 otros hombres, mujeres, y niños de los Lakota que fueron masacrados por los soldados de los Estados Unidos en las orillas de arroyo de Wounded Knee en Dakota Sur. En las narraciones de la historia oficializada por el sistema de educación de los Estados Unidos, la Masacre de Wounded Knee 1890 se toma como punto de referencia para marcar el “fin” de la resistencia de las Naciones Originarias contra la colonización del “hombre blanco” el cierre de loa frontera de oeste para los norte americanos en su proyecto de “Destino Manifesto”. El concepto de Destino Manifesto es la continuación de nefasta Doctrina del Descubrimiento de las Coronas de la Cristiandad por la cual entra España y Portugal inventaron una teoría legaloide de desposesión territorial que fue santificada por el Papa Alejandro VI en las Bulas Papales Inter Caetera 1493. Siendo nietos no de España o Portugal, los gringos invasores como nietos de Inglaterra tuvieron que modificar y ampliar la Doctrina de Descubrimiento para cubrir sus agresiones genocidas con el perfume racista de la “Civilización Occidental” y la superioridad racial del “hombre blanco”. Esta historia oficial de la conquista del continente norte americano por los angloamericanos sufrió su ruptura fatal y fue destituido en el levantamiento de Wounded Knee 1973, cuando por mas que dos meses, doscientos hombres, mujeres, ancianos y niños indígenas negaron doblarse ante el ataque del poder militar mas grande en la historia de la humanidad, el cuerpo militar policiaco de los Estados Unidos de Norte América. Trece años después en 1986, en conmemoración de la masacre de Wounded Knee 1890, tres hombres Lakota iniciaron una cabalgata ceremonial de sanación retomando la ruta de Spotted Elk hasta el sitio de su masacre en Wounded Knee en 1890. La ceremonia es nombrada como Secando las Lagrimas, uno de siete ceremonias tradicionales de los Lakota que incluye la Danza del Sol. Uno de estos tres hombres Lakota era Birgil KIlls Straight, quien falleció recién el 10 de febrero de 2019. Por tres días, desde 16-18 de febrero los Lakota realizaron la ceremonia de despedida en su forma material de su hijo, mayor, tío, abuelo, y sabio tradicional Birgil Kills Straight en la comunidad de Kyle, South Dakota de la reservación de Pine Ridge. Las lagrimas volvieron a caer, fueron recolectados en la jícara de la memoria colectiva de los Tiospaye Lakota (clanes tradicionales) y luego otra vez mas con el poder celestial fueron secados ceremonialmente y sembrados de nuevo en esperanza de la regeneración de las siete generaciones futuras no nomas de los pueblos originarios de Madre Tierra, pero igual y parejo para todos los hijos e hijas de la humanidad. Como es también tradicional, no nomas para los Pueblos Originarios, pero para toda la humanidad, entre los tres días de ceremonia de despedida de Birgil Kills Straight, se alcanzo a compartir una meditación en el susurrar de los cuatro vientos. En el suspiro de cada uno, con el recordar de cada uno, se hizo un trabajo espiritual retejiendo los sentimientos de dolor, masacres, valor, los levantamientos, y la regeneración de las Naciones Originales de la Gran Tortuga Abya Yala. Cuando una madre mexicana, entre cazada con los Lakota en Pine Ridge ofreció un consuelo en forma de un pozole de maíz y carne de búfalo, la memoria ancestral no tuvo que caminar lejos. Luego luego, se recordó la llegada de la Comisión Continental Abya Yala en Standing Rock en 2017, y también el liderazgo de la Confederación Oceti Sakowin en el año 2000 como guías espirituales de la Primera Cumbre Continental Indígena en Teotihuacan, Mexico. Los caracoles de los horizontes de los cielos, los sueños de las Naciones Estrellas nos convocan otra vez mas, no con lagrimas de tristeza, sino con gotas de Fuego Sagrado, coraje y valor hechos de puro amor a la vida, y también para nuestra Sagrada Madre Tierra Tonantzin, quien no da nacer y al fin también quien nos recibe en sus faldas de barro, de agua, y de paz. Entre ellos, que son innumerables, las Naciones Estrellas como ancestros de nuestras Naciones Originarias de la Madre Tierra, ya cuentan con un hermano más de luz y valor. Birgil Kills Straight, Lakota - PRESENTE!